This month’s best eye candy isn’t concerned with conforming to the rules of reality; November is devoted to the psychedelic and surreal—appropriate given the day and age. For a counterpoint, the Ken Kesey hallucinogenic mind-trip of the ‘60s was forged in the wake of events like the Cuban Missile Crisis and the Vietnam War. Hugs, drugs and Jefferson Airplane were the best anecdotes for an unflinchingly brutal theater of American and international politics. So it should be no surprise that the current domestic discord would invite a renaissance of tie-dye good vibes to counterweight concerns over looming walls built around, and within, our fair country. Joelle Jones snags two spots in the above Gallery, one featuring Ms. Marvel reveling in the majesty of the American flag and another of the titular Lady Killer basking in a pattern of swirling, retro patterns. 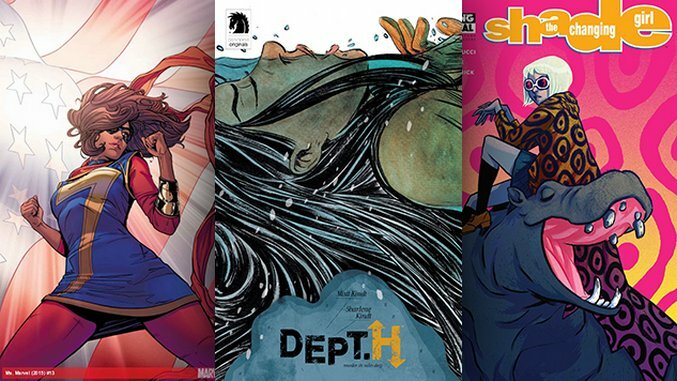 Becky Cloonan’s cover to Shade the Changing Girl embodies the trend potently, showing titular reality-bender Loma perched on a hippo in an outfit that could only be described as Warhol squared. David Rubin (Ether), David Mack ( Jessica Jones), Christian Ward (ODY-C) and David Aja (Scarlet Witch) also expand some minds this month with their sterling cover art. Let us know your favorite art from November on our Twitter feed.